Why, in dry and warm climates, are tree leaves thick? How have they adapted this way? Trees in hot, dry areas do NOT have thick leaves. Only succulent plants have usually thick leaves. Several plants (aloe, Crassulaceae, etc.) have thick fleshy leaves that allow water accumulation inside tissues. We call succulent plants such plants with tissues that has the capacity to store water. If you want more information, the website of the Botanical Garden talks about succulent plants (only available in French, though). Trees in desert regions have generally thin and leathery leaves that reduce transpiration and thus the amount of water lost by leaves. 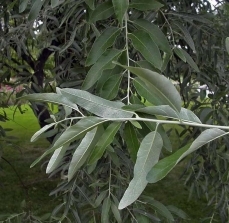 Olive trees leaves and some conifers in the Mediterranean region are good examples. The layer that protects the epidermis of leaves of these trees, the cuticle (Protective layer of the epidermis. ), is thick and waxy. These trees also exert better control of leaf pores responsible for gas exchange with ambient air, stomata (A minute epidermal pore in a leaf or stem through which gases and water vapor can pass. ), to further minimize water loss. You can see here an animation about leaf adaptation of an oleander to the Mediterranean climate. This baobab has a succulent trunk and sheds its leaves before the dry season. In some woody plants (including shrubs), the seasonal loss of leaves can cause a desired reduction in the amount of water needed. The tree enters dormancy during the driest season. There are some succulent trees: baobabs are the best known. 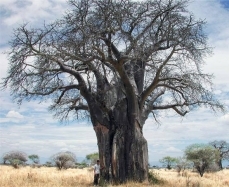 However, the succulence of the baobab tree is not found in its leaves but in its trunk. I hope this information will be useful. Have a nice day!